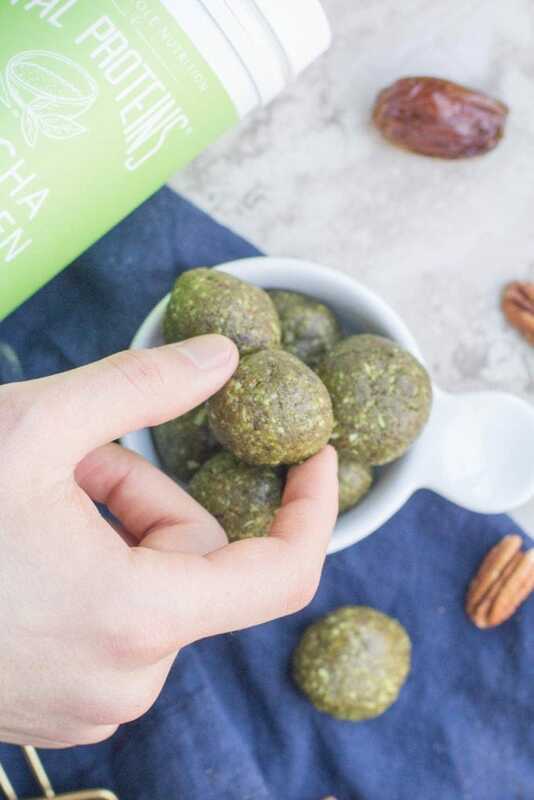 These Whole 30 Matcha Energy Bites are packed with healthy fats and protein. 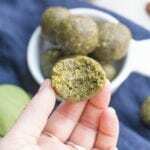 They are a perfect whole 30 friendly, gluten free snack for meal prepping + enjoying throughout the week! This post is sponsored by Vital Proteins. Up until a few weeks ago, I totally didn’t understand the matcha hype. I had seen all the beautifully crafted matcha latte’s online, heard everyone chatting about matcha and how delicious it was on Instagram stories, saw it on the aisles of every store…but I had never tried it and really didn’t understand why it was so great. Let me tell you… the hype is REAL. I’m 100% not one of those people that rushes out to try the newest craze on Instagram, or does something just because I see other people doing it.. but I really regret not jumping on the matcha train sooner. Cause it’s soooo yummy. Matcha has a whole slew of benefits that you can read about here. The major thing matcha is recognized for is having over 100x the amount of free radical fighting antioxidants that other green teas have – which is kinda awesome. 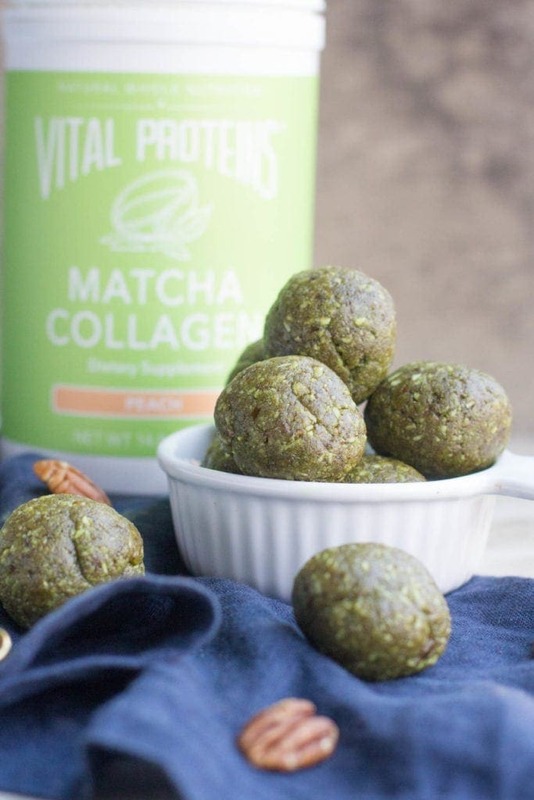 Vital Protein’s Matcha is unique because it’s blended with their collagen which you already know I LOVE because it makes my hair, skin + nails grow like no other! 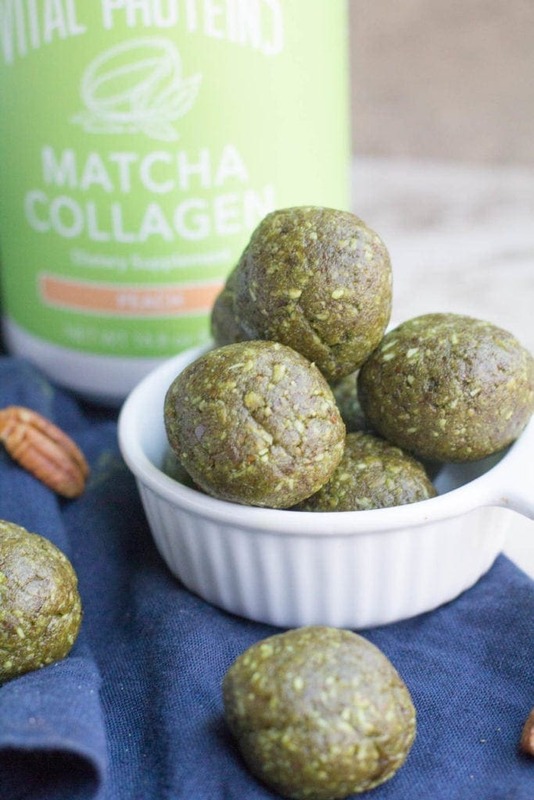 While we’ve been loving drinking our Matcha Collagen to warm up in the mornings or as an afternoon pick-me-up – I thought it would be so fun to blend it into my favorite thing – energy bites! Since it is already gluten, free, dairy free, and has no added sugar – I knew it would be perfect for making a Whole 30 snack. 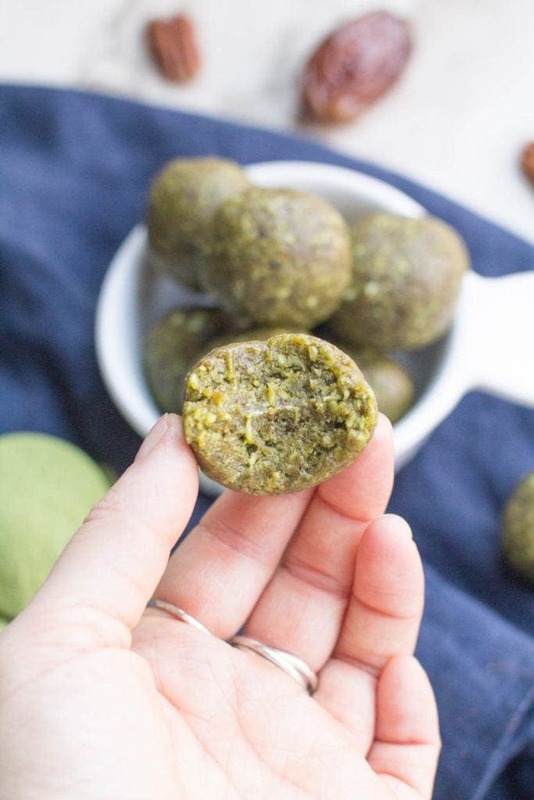 In case you guys haven’t picked up on this – I love making my own energy bites to have on hand for during the week. Whether you’re doing a Whole 30 or not – they’re great to have in the fridge on hand, and they’re significantly cheaper to make than buying your own bars (As much as I love these RXBars they can be pricey and I don’t always want a whole bar – sometimes I want something smaller! I couldn’t help taking a bite out of these little bites when I was shooting the photos.. they were just TOO yummy not to. I actually just ate the last one of these for a snack while writing this post and I’m sad to see that they’re gone. 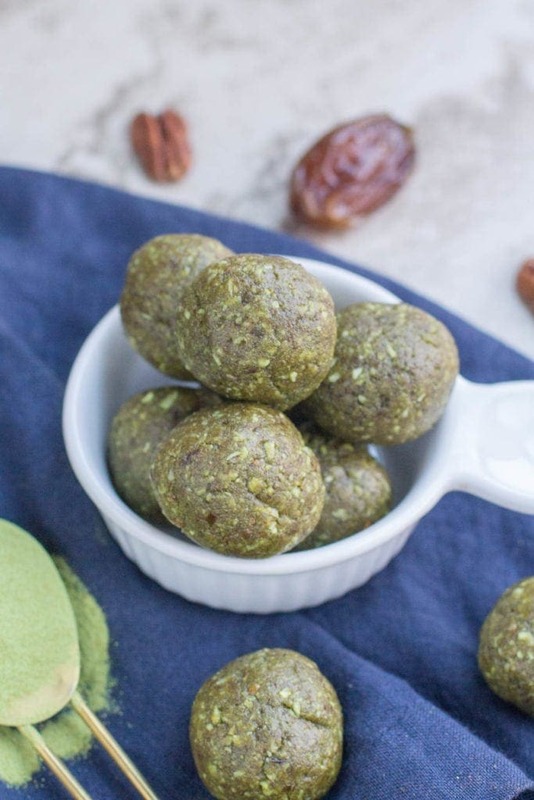 Making another batch is definitely on the top of my to do list… along with enjoying them with a biiiig matcha latte! (Which, if you haven’t stocked up on your matcha yet – you can get it here.